US President Donald Trump is hopeful of another meeting with President Duterte as the two countries move to reinforce their alliance amid common concerns including China’s aggressive actions in the South China Sea. Secretary of State Mike Pompeo raised the hope of a new meeting between the US and Philippine leaders in his first-ever meeting with Foreign Secretary Alan Peter Cayetano and National Security Adviser Hermogenes Esperon in Washington on Tuesday (Wednesday in Manila). Philippine Ambassador to Washington Jose Manuel Romualdez, who also joined the meeting, said Pompeo expressed hope for a second meeting between Duterte and Trump as a follow up to the “productive and warm friendship” that the two developed during the Philippine hosting of the ASEAN summit in Manila last November. In that meeting, Cayetano delivered a personal letter from Duterte congratulating Trump for the successful summit with North Korean leader Kim Jong Un in Singapore earlier this month. 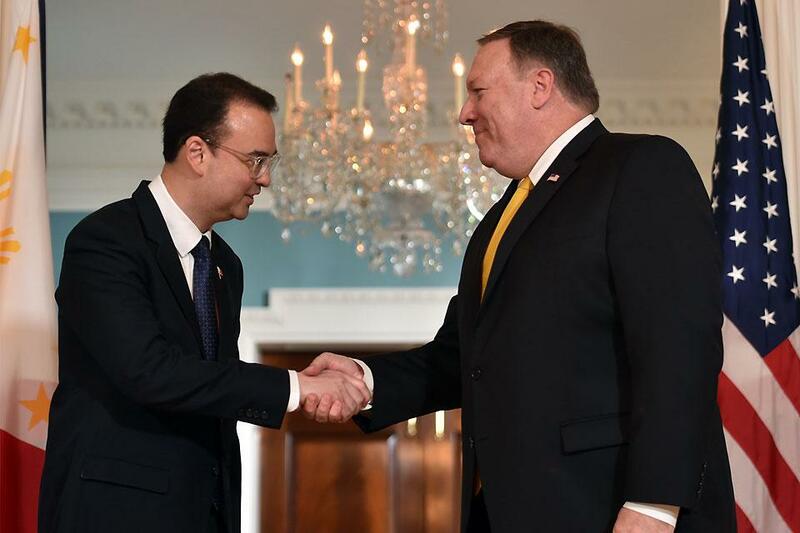 “Secretary Cayetano and Secretary Pompeo had an open and cordial interaction at the State Department today and we are optimistic this would reinforce the ties that bind the relations between our two countries and peoples,” Romualdez said. “The Secretary told Secretary Pompeo the Philippines views the current developments in the Korean peninsula with optimism and that the Philippines is hoping the positive momentum generated by the Singapore Summit will bode well for the broader Asia-Pacific region,” he added. The meetings in Washington, Romualdez said, allowed Cayetano and Esperon the opportunity to share with their American counterparts the independent foreign policy of the Duterte administration and its positions on such issues as the South China Sea and the Korean Peninsula. Philippine and US officials agreed to intensify its long-standing alliance amid China’s massive expansion and military presence in the disputed South China Sea, which is feared to incite instability in the region. Although the United States does not take sides in the sea disputes that involve the Philippines, China, Vietnam, Malaysia, Brunei and Taiwan, Washington has repeatedly stressed that as a Pacific power it has a national interest in freedom of navigation, maintenance of peace and stability, respect for international law, and the unimpeded, lawful commerce across its sea lanes. The Duterte administration has avoided criticizing China but insisted that it will not concede a single inch of Philippine territory to its Asian neighbor, which claims “indisputable sovereignty” over 90 percent of the waters. Undersea gas, oil and mineral deposits have been discovered in several areas in the South China Sea. China has also claimed and developed some features within the West Philippine Sea. Compared to former President Benigno Aquino III, President Rodrigo Duterte has made friendly overtures to China. Duterte’s decision to set aside the country’s arbitration victory over South China Sea territories has improved Manila’s relations with China and allowed Filipino fishermen to return to the Scarborough (Panatag) Shoal as promise of huge development assistance poured in from Beijing. Despite friendly ties with Duterte, China’s aggressive stance in the tense waters persisted as it beefed up its reclamation activities in disputed areas and transformed previously submerged features into artificial islands with multi-level buildings and runways. It has also installed surface-to-air missiles in these areas, triggering concerns from countries, such as the US, Japan and Australia. This article was originally published on GMA NEWS. Copyright © 2015 www.ofwpinoystar.com. All rights reserved. Unauthorized distribution, transmission or republication strictly prohibited.